Guest author: Dr Ward Goldthorpe, Sustainable Decisions Limited. 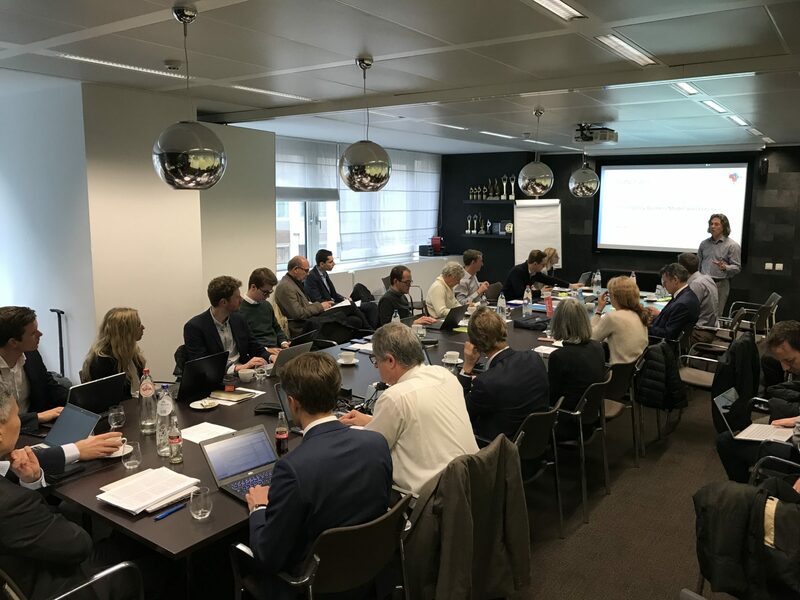 On 14 March 2019, Work Package 3 (WP3) of the ELEGANCY-project held a joint workshop in Brussels, Belgium, together with the Zero Emissions Platform (ZEP) on ‘A Framework for CCS Risk Sharing and Business Model Selection’. To peer review the work carried out by Sustainable Decisions Limited (SDL) on developing a framework for H2-CCS or CCUS business model selection and assessing business cases in the context of public and private sector collaboration for risk mitigation. To review the work of the ZEP temporary working group on ‘Collaboration across the CCS Chain’, which has been assessing the ways in which CCS investment barriers and risks can be removed or mitigated through public and private sector risk sharing and joint business models. To merge the results of the two work programmes so that the ELEGANCY WP3 framework can be optimised and to develop a set of recommendations for facilitating public and private sector collaboration on business models and business cases. The interest in the workshop was very high with a total of 28 attendees representing industry/projects, government/public sector, research institutions and NGOs. Some of the participants were also from the ERA-NET ACT ALIGN project. A large amount of pre-read material was made available to people who had registered, including the ELEGANCY WP3 public report D3.3.2 ‘Policy issues, business risks, de-risking instruments and incentive mechanisms relevant for the case study countries’, to help facilitate a deeper understanding of the subject matter and fuller discussion. Ward Goldthorpe led the discussions in his quality of co-lead of the ZEP working group and leader of ELEGANCY WP3 work on the development of business models and commercial structures for the H2-CCS value chain. He gave the attendees a recap of the first workshop outcomes and recommendations as well the working group’s ideas on how to facilitate better collaboration between governments, public departments/organisations and private sector investors. The difficult issue of the magnitude and timing of the financial security required by the EU CCS Directive for handling long-term geological storage risk and leakage liability was reviewed, and the conclusions of the working group on how to share the mitigation of this investment barrier was presented. During the morning and early afternoon sessions, Lionel Avignon from SDL presented a summary of their ELEGANCY work that will appear in the two forthcoming WP3 reports. Firstly, an overview was provided of the WP3 business model development methodology, how the ELEGANCY framework defines two scales of business model: one at the system level (required for overcoming barriers to investment) and one at the business segment level (for mitigating operational risks). This session also presented the business model drivers and the major generic components used to define an investable business model when allocating risk between the public and private sectors. The session was followed by an overview of business case development and how the linkage between business models and business cases is dealt with in the ELEGANCY WP3 methodology. A number of business case assessment protocols from public sector and multi-lateral bank organisations were highlighted for reference. The 6 business case dimensions used in the ELAGANCY WP3 templates were presented along with guidelines on how to populate them to create a successful business case. Finally, after these two sessions, the ELEGANCY Business Model Selection Tool was demonstrated to the workshop attendees to obtain feedback on its functionality and utility. How to determine preferences and priorities for business models that remove investment barriers utilising collaboration between the public and private sectors. The need for policies to support market development and the link between these and business models such as public-private partnerships (PPPs) and regulated asset based (RAB). A review of the limitations of private sector insurance for geological storage leakage risk. How to make a joint business case that works for both public and private sector stakeholders. The combination of company, government and NGO experience and ideas resulted in a broad set of contributions and conversations and as a result in a fertile set of information for the WP3 team to assimilate into their work. The workshop has provided positive feedback about the design, functionality and usefulness of the business model and business case framework that has been developed in ELEGANCY WP3. In addition, some new ideas generated by the workshop discussions will be included in the business case templates and decision support tool that are to be included in the forthcoming public report D3.3.4. The workshop was hosted by Weber Shandwick, the provider of communications and public relations support to the Zero Emissions Platform.